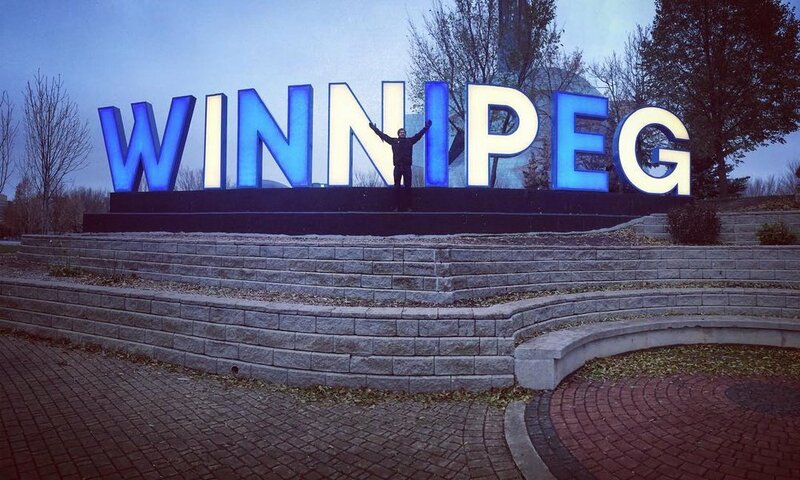 A lump of joy and anticipation sat in our throats as we saw the sign pass welcoming us to Manitoba. Small clumps of aspen trees, glowing whiter than paper birch, dotted along the highway on an endless stretch of flat land cut with rail and highway. 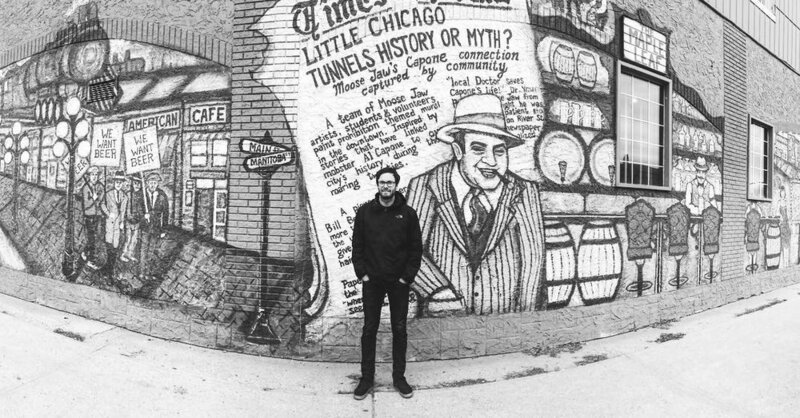 We were beginning to believe the tales of boring cross-country drives when we noticed a big sign on the side of the highway marking the longitudinal middle of the country. Excited to have reached such a milestone, we stopped briefly to stretch our legs and take pictures before taking to the road once more. The longer we spent on the endless Trans-Canada Highway, the more we found little nuances began to spring up from the seemingly mundane landscape: a halo-like horizon that encompassed us, a deep sense of wandering a boundless earth, and an eerie peace that hung in the vast emptiness. A soul had room to breathe here. A mind could wander. You could forget or remember here, losing yourself in a forever sky. There was far more here than nothingness; there was an inescapable feeling - much like the threatening clasps and groans of an ocean - that made you turn inward and acknowledge your small-ness. Humbled, quiet, and curious, we drove into Winnipeg to discover our first glimpse of a bison heard at Fort Whyte. Afterward, we treated ourselves to a stone-fired pizza and enjoyed a frigid ‘Winterpeg’ stroll around the most beautiful riverfront we had seen in our travels - highlighted of course by the stunning Riel Bridge. The road led on and on until the land began offering glimpses of old grain elevators and infinite patchwork farms with their sweeping irrigation limbs. We barely saw the sign for Saskatchewan pass by as the sun began to set all around us. Coyotes could be heard moaning in the distance. Deer and cattle dotted across pasture land. With nothing to hide them, the many beasts that roam the heart of our country wandered in plain sight - seen from all distances - nearly oblivious to the boundaries we attempt to enforce. Standing beneath an endless sky brimming with colour, an otherwise barren landscape began to awaken and teem with abundant night life. One by one, a thousand stars pierced the black sky, and a nearly-full moon lit our camp, sentient as the strange night conjured new sounds. A curious patch on the road map encouraged a stop in a little town called Maple Creek where we based ourselves for two days of exploring. An excellent cup of coffee led to a chat with a local woman who encouraged a visit to Cypress Hills Interprovincial Park and whom provided local knowledge of how to access the Great Sand Hills. The ‘mountains’ of Saskatchewan’s Cypress Hills were a natural wonder from which one could see for miles to distant towns across the vast plains. Wildlife outnumbered people here - although we did not see the resident heard of caribou - we encountered several deer, a beautiful eight-point buck loping across a nearby ranch, and narrowly dodged a run-in with a moose grazing in the middle of the road to our hiking trail head. We pulled into the tiny parking cove and stepped outside to a completely different world. It was like someone had scooped up part of the dessert and gracefully placed it precisely where it had no business being. 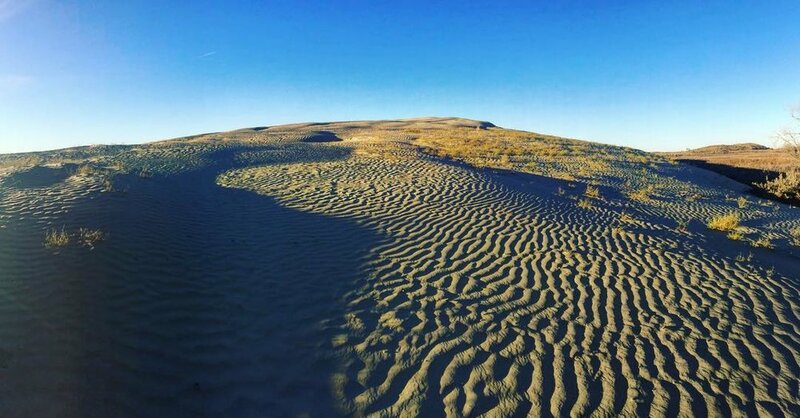 We wandered among the rippled dunes and passed innumerable animal tracks, thousands of wild sage bushes, and felt the hair stand up on our necks when the distant evening moans of coyotes started. The slow sunset drive back to Maple Creek entertained us with herds of exotic prong-horned deer navigating their way across the plain, always stalked by some sort of wild prancing beast - eyes glinting in our headlights. The next few days would take us through cities with names that conjured a faceless familiarity. 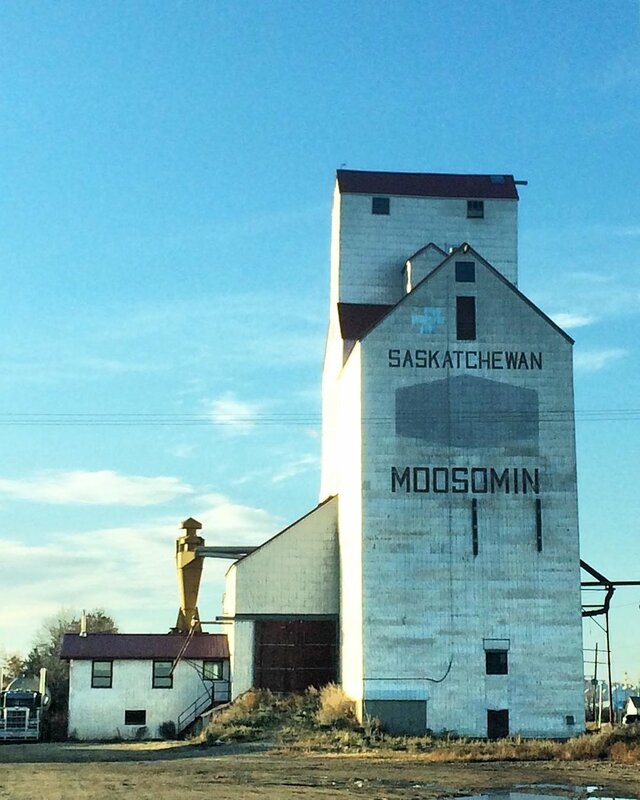 Driving through places like Medicine Hat and Swift Current were akin to meeting a celebrity and finding out they were only human after all. The badlands beckoned us on and hills began to suggest mountains in the days to come. The sentient bobbing pumpjacks welcomed us to wild rose country and we set a course for Drumheller. Meeting locals who were full of suggestions, enthusiasm, and wisdom. Stalking prong-horned deer down backroads. 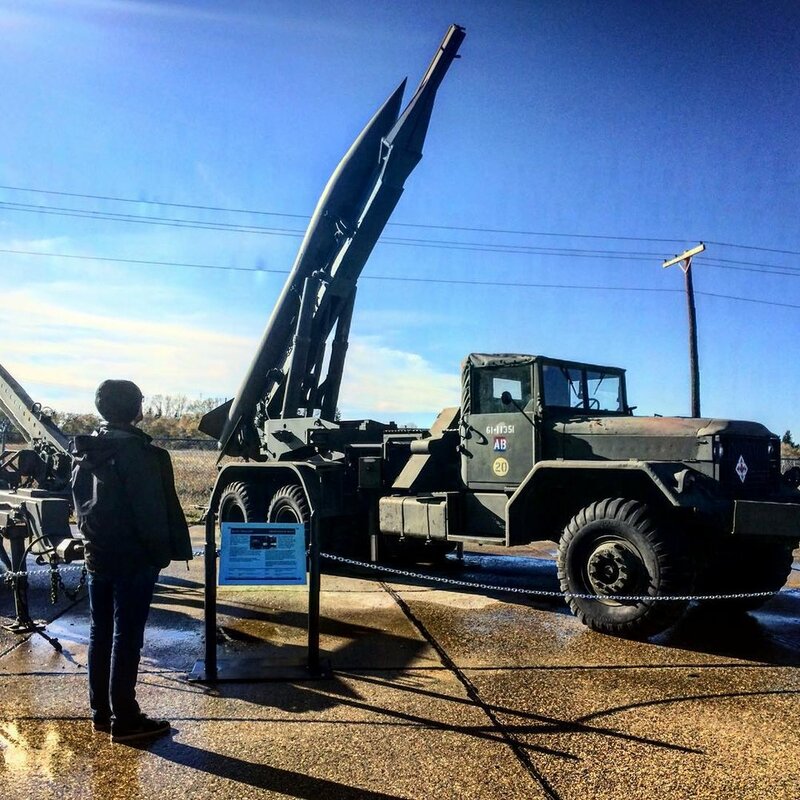 The artillery museum at CFB Shilo. The MILLIONS of migratory snow geese that had us craning our necks to the sky for days on end - watching their flocks go by - totally mesmerizing. The biggest sky just FULL of snow geese. Unforgettable. Sod houses! We got to visit one at Fort Whyte. So much science! Also, BISON. Longboarding in Regina along the river. Also, racing longboards bobsled-style in Regina along the river lol. We are dreaming of spending time horse-back on a ranch one season. We loved the prairies! Our experience of our home province is an ode to every person whom has called a giant region of land, home. Ontario is a BIG place. It took my family five hours to drive from St. Catharines, where I grew up, to our summer cottage rental in North Bay every summer. One way. If our car didn’t break down… or didn’t get stuck in Hwy 400 traffic. Long road trips are a Canadian way of life, and I treasure the memories of these trips spent nuzzled up next to my sisters in the back seat, sharing sweat and hating each other. Alas, in thirty years, I had never ventured further than Barrie around the Great Lakes, no further north than North Bay, and a rafting trip to the Ottawa river had only just happened last summer. This left the ENTIRETY of northern and north-western Ontario completely unexplored by neither myself, nor Ryan. After back-tracking all the way from the furthest reaches of Newfoundland, we were excited to finally be exploring once more! 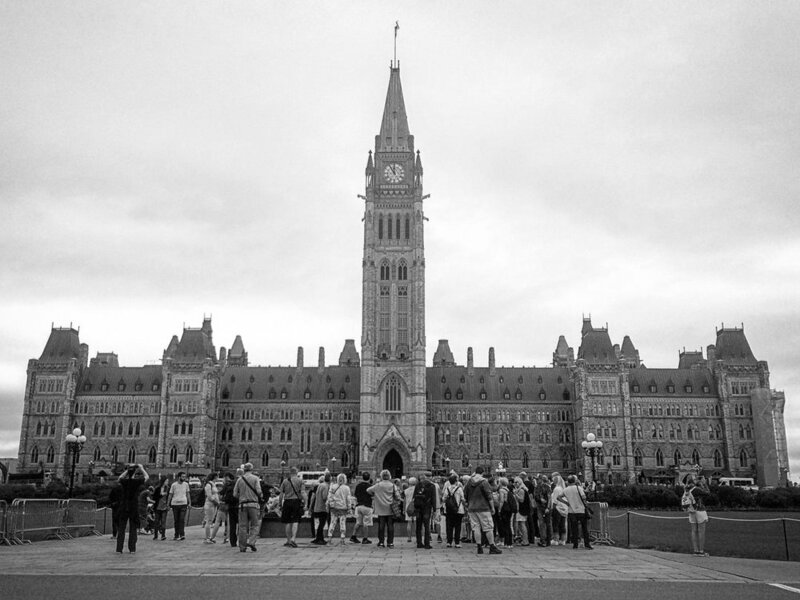 A cross-country trip would not be complete without a visit to it’s capital. 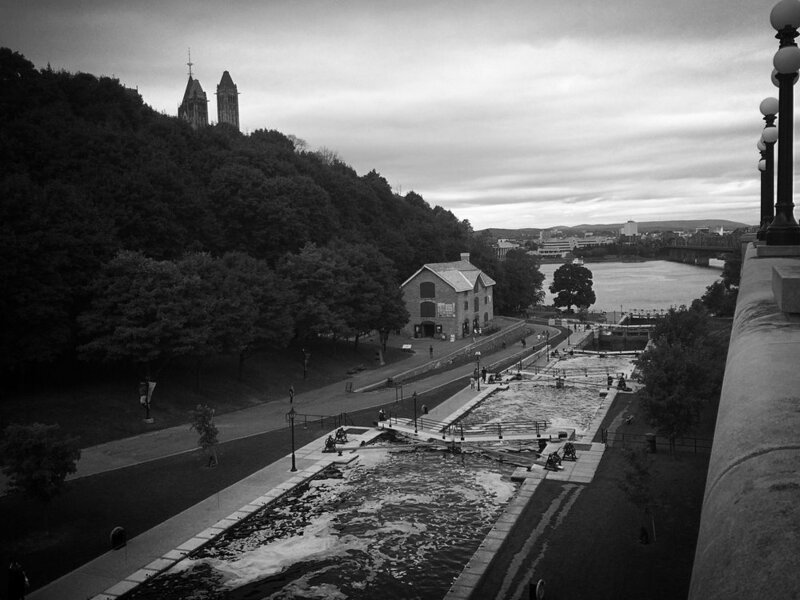 Ottawa did not disappoint. 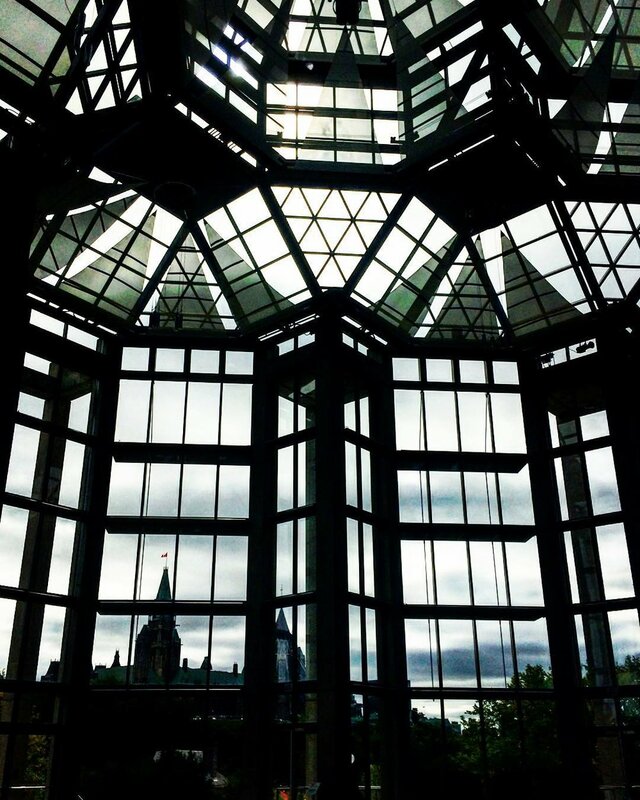 After an incredible visit with my cousin in Gatineau, we spent a full day ogling parliament buildings, taking in the National Gallery exhibit, touring through the Market (Planet Coffee is bueno! ), and walking as far as our parking meter would allow. We took a couple of weeks to relax with family and friends, make a few changes to our storage space, change out some gear from storage, and just begin to comprehend the adventure we had been on. After hugging and kissing our loved ones goodbye once more, we headed to Collingwood where we treated ourselves to a spa date and checked out the annual ski swap to outfit us for our winter in the mountains. Up, up, and away… we didn’t stop until we reached Sudbury - home of our new favourite dodecahedron - which was the perfect gateway to Killarney Provincial Park. We spent an unforgettable day hiking “The Crack” and fantasizing about completing the La Cloche Silhouette Trail some day. This place in all of its fall glory made it obvious why the Group of Seven painted here. ﻿I’ve been obsessed with visiting Pancake Bay Provincial Park since I first heard its name. It was a gorgeous half-moon beach with pristine fresh water that lapped lazily along the sprawling shore. Petrified driftwood stuck up in odd places and the cold wind nipped at us through our fall jackets. It was hard to believe that we had been sweating and climbing mountains in Algoma just days before. Lake Superior’s gigantic coast gave us jumping trout at Sand River, a giant Canada goose in Wawa, Winnie the Pooh in White River, and the bluest, coldest, magical sunset over Pebble Beach in Marathon. Neys Provincial Park felt like Cape Breton and gave us our first snow. 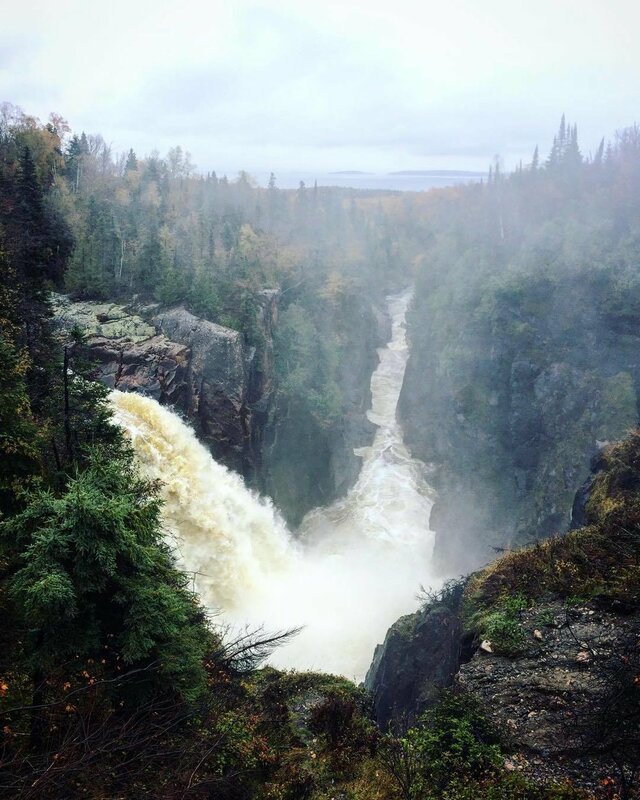 Thundering Aguasabon Falls greeted us as we stretched our legs on the legendary Voyageur Trail before we finally made it to mythical Thunder Bay. ﻿…was awesome. 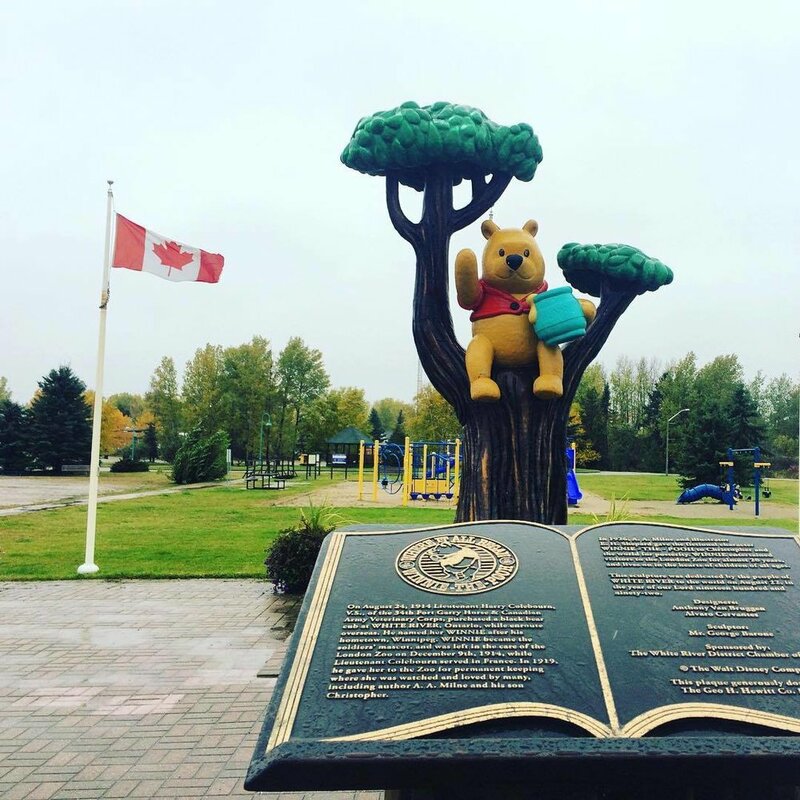 Highlights included the Terry Fox monument and its amazing view of both the city and Sleeping Giant Provincial Park, Hoito Restaurant and their amazing pancakes (10% of Thunder Bay is Finnish! ), the world’s second largest curling rock, and the shale-covered portage trails that slink around rushing Kakabeka Falls. 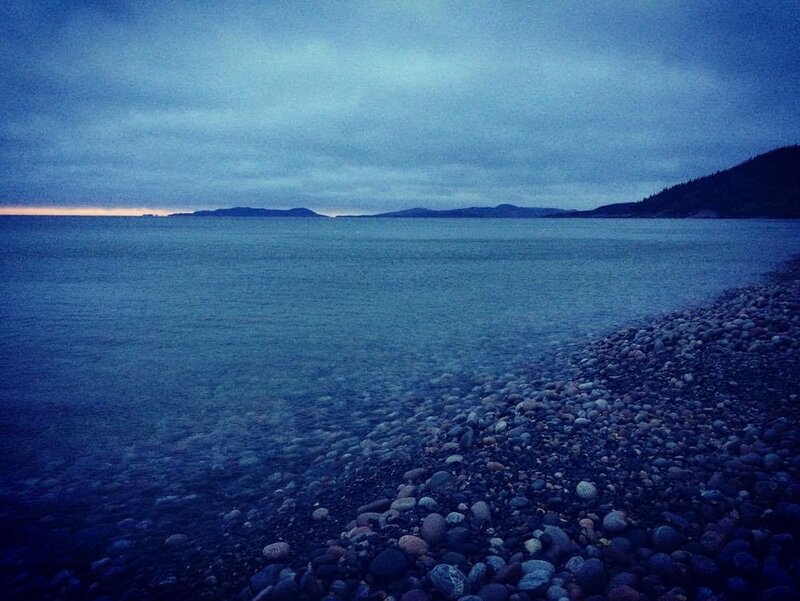 We had to say goodbye to Lake Superior as we finally made our way toward the Manitoba border. 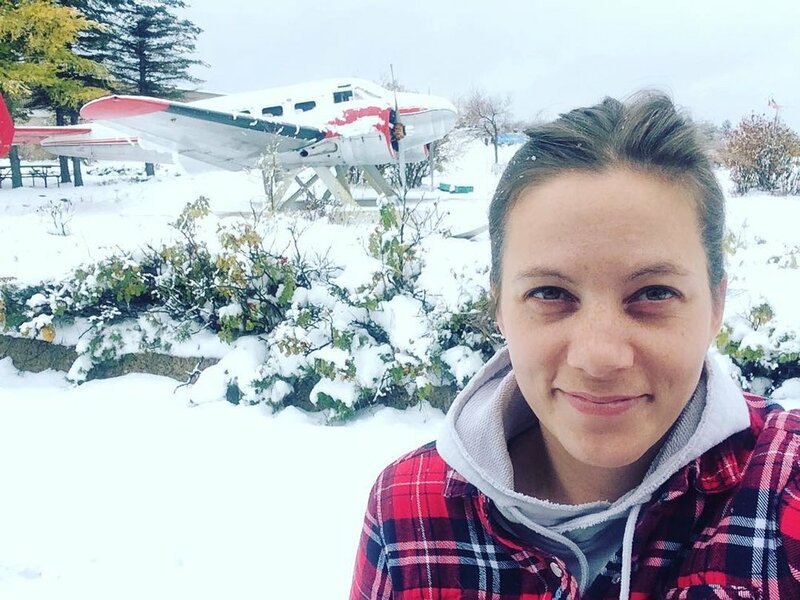 We found a float plane on the side of the road in Ignace, Ryan touched Max’s moose taint in Dryden, I made a snowman, and we met Huskie the Muskie in Kenora (and new friends Sarah & Mike from Tiny House Army Truck!). The east coast served up some incredibly memorable rides this passed summer, but Ryan and I agree that our personal best rides were in La Belle Province. Smack in the middle of the ancient Laurentians, there are so many tiny villages offering up big trail days. The riding out there is overwhelmingly endless so we honed-in on a few legendary hollows and rode some world-class terrain we won’t soon forget. Without further ado, here’s the dirt on our top three destinations. Easily ranking at number one is the little village of St. Raymond. This teensy hamlet - with its narrow winding roads and yard-less houses that sit cozied up to the curb - roosts about 40 minutes west of Québec City on the Rivière Sainte Anne. Not only did we find free riverside overnight parking as well as some local micro-brew, we also had an EPIC day grinding through some tasty, one-way, classic single-track that wove through old gnarly forest, sunny farm fields, and forgotten backlot gullies. The natural technical level of some of this mountain-side system was a treat to navigate and brought out the very best in our older, yet, super capable Norco 26er setups. Every gut-busting climb was rewarded with a long flowing downhill that ranged from smooth and bermy to fast and edgy. There was something for everyone here from beginner to expert and exploring some uncharted territory on brand spanking new Echo de Juliens capped our flight through the woods with style. 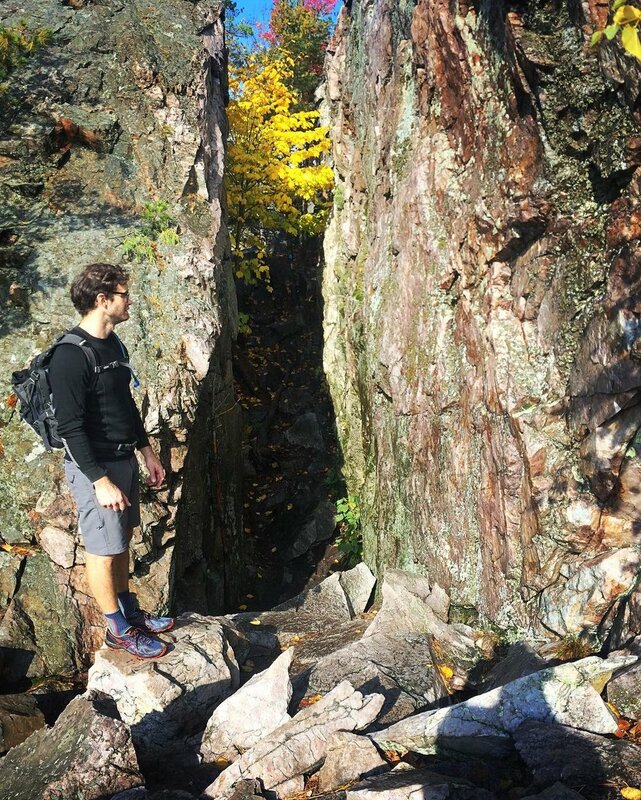 Our only regret was not venturing further north to St. Raymond’s sister trails at Shannahan . Apparently, they rival St. Raymond! (if that’s even possible). Should you visit (and you should), spend the money and stay for two days to ride both areas (your single day pass is good for both areas, but you’ll want a full day at each). It’s a solid ten-out-of-ten from us. Don’t end your trail-hopping vacay here - you’ll be way too stoked for more. 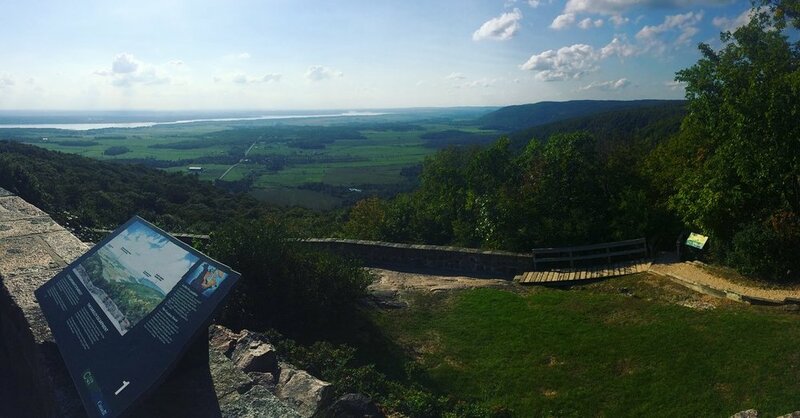 You’re thinking one of two things right now: Oh please, there’s so much more to Quebec than Mont Sainte Anne, or, Why isn’t a 100km+ trail system ranked first!? YES, MSA is a Mecca for downhill and cross-country riding alike and offers a plethora of amenities due to its year-round ski chalet infrastructure. YES, there is more to riding in Quebec than this popular and sometimes very crowded recreational hub. YES, it is a tad obvious that MSA made our list. And lastly, YES, we had several amazing trail days here that are well worth giving it our #2 spot. We feel that MSA gets mixed reviews, albeit, positive ones. For us, it was a total package: camping right at the trail heads, variety of terrain, endless route choices, expertly built and groomed lines, and an ‘après-vélo’ tail-gating culture that bred a chill, friendly atmosphere of community. Suddenly, you imagine yourself living in one of those St-Ferréol chalets and spending all your money on lift tickets and trail passes. Whether your throwing yourself down a gnarly triple-black diamond hell-chute or slinking through the woods on a winding ridge, we both agree that rolling up and down this mountain is a day well spent. Our mud-soaked, sweat-fest at this punk-as-feck mountain will go down in history. We had two very different and memorable experiences here, but both of them started with a local telling us to do them a favour and go here instead of Mont Ste. Anne. For the beginner rider, expect to have your lungs and legs handed to you well-done - especially if the track is a little on the damp side. Maybe it was a personal off-day, maybe it was actually that hard, but it was my toughest ride to date. That said, epic trail day. If you’re intention is to progress your skill level on a varied and expertly built track - you have to add SDM to your list. Expect to feel like you climb more than you descend, and revel in some great opportunities to take flight, roll boulders, and push your endurance. Now for the experts in the audience: welcome to FUNLAND! The shouts and whoops of happy downhill monsters can be heard echoing through the trees. Some seriously big engineered walls and knee-shaking descents are sure to get your heart pounding and put a permanent grin on your big dumb face. If MSA feels a little ‘been there, done that’ than this is where you belong. This smaller network allows you to climb to the summit a few times in a day, and the pitch of the mountain allows for some surprising down-hill on a relatively small mountain terrain. If you choose to stay overnight (for a fee), you’ll rest soundly having driven in through the upper-crust community of Lac Beauport. No worries if you decide to camp elsewhere, the hot showers and bike wash station are free for everyone. It feels a tad late now to be writing about The Rock. We set sail home a month ago now. This chapter was unlike any other. It feels like from the time we left Cape Breton, time just became a wash. We sped up, filled our days to the brim, saw an extraordinary amount of people and places, kissed the cod, and somehow we are back home in Ontario now. It’s like we visited another planet and woke up home in our beds. Did it even happen? And that’s what Newfoundland feels like. It’s a world away. Totally wild and gnarled with age and weather. We touched rock that had been forced up from the Earth’s crust, spent sleepless nights at the mercy of howling wind, climbed a mountain of scree, spied remarkable creatures, and felt just a touch of the power of the North Atlantic. Never has a place demanded such reverence. Even the light is different somehow. And all of this is juxtaposed by the inexhaustible warmth and hospitality of the people who call it home. 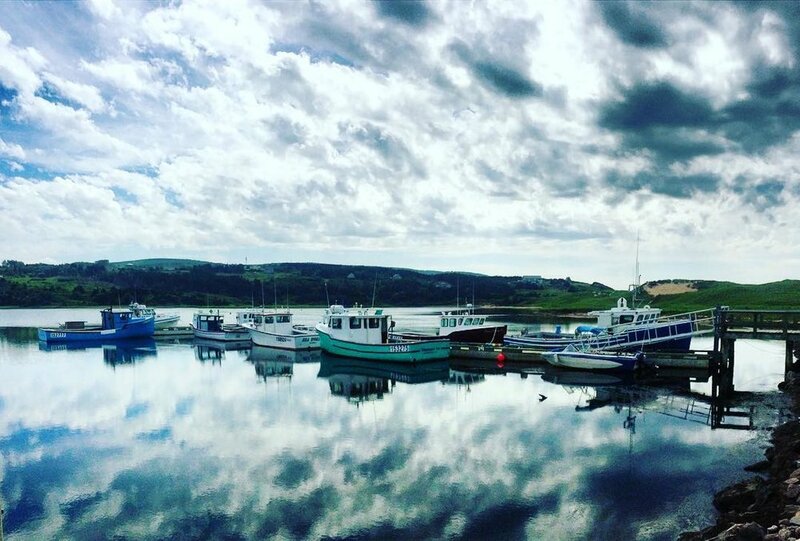 Of the many places we visited this summer, we both agree, Newfoundland needs a repeat visit. If you should find yourself planning you’re own inspired voyage to this astonishing, eastern-most Goliath, here are a few not-to-miss spots and key tips from us to you, with love. June is iceberg time. You don’t have to go to Twillingate to see them. icebergfinder.com is where you can hunt them down. The Northern Peninsula is WINDY. There’s a FREE campground in far-flung Cape St. George and it’s SO worth the drive. Puffins and whales do not require a tour. There is a FREE ACCESS puffin colony in Elliston and you’re likely to have a visit from the local minke whale population while looking out over the bay from your seat at the Bona Vista Social Club. 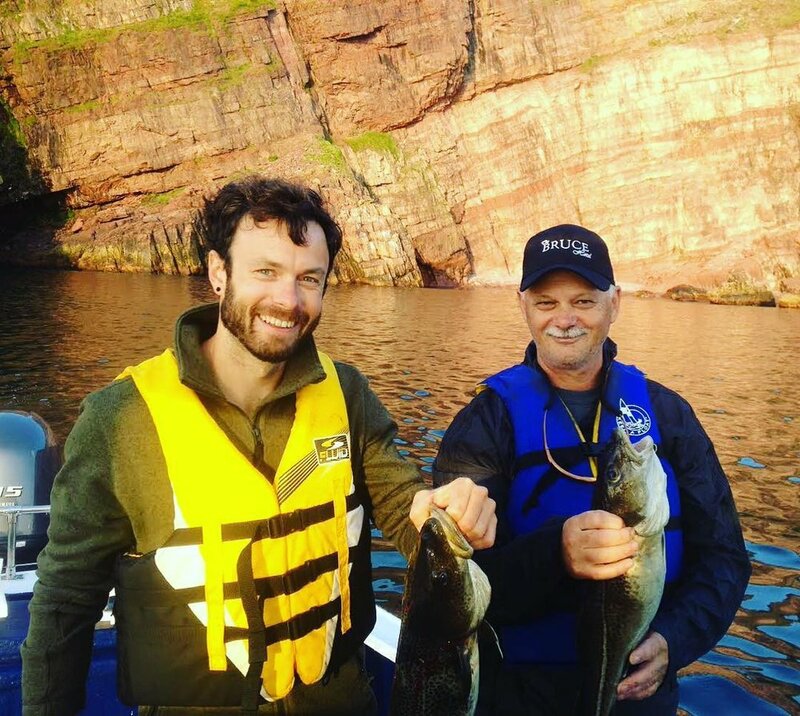 Give yourself a week to explore the Avalon Peninsula. 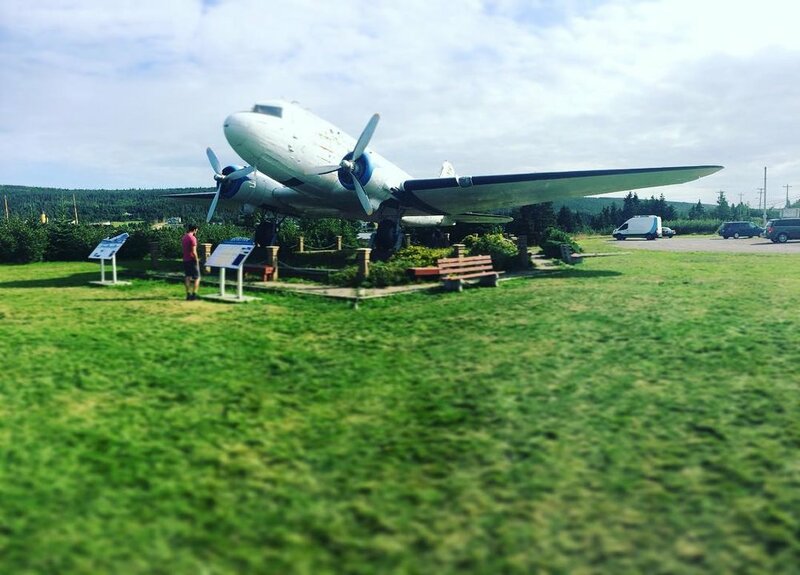 It’s big and is home to 80% of Newfoundland’s tourist hotspots (personal opinion). 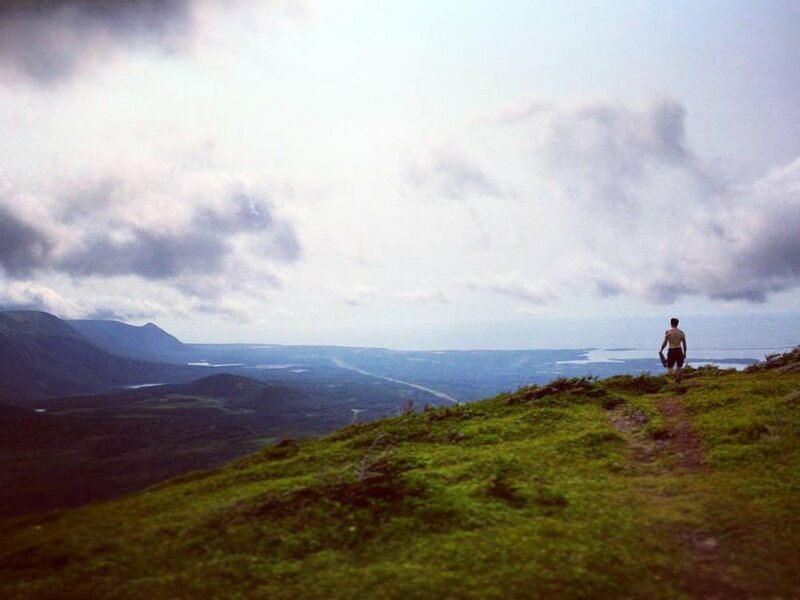 Hike Gros Morne Mountain and camp at the Berry Hill campground. One might choose to take a kayak tour in Bonne Bay over the fjord boat tour. Maybe. Best fish n chips ever: The Duke of Duckworth in St. John’s. Hands down. If you have the opportunity to go cod fishing via handline and jig, GO. Hike the Skerwink and Starlite Trails. Don’t drive after dark, dummy. There are more moose per square kilometre than people. If you go early enough in the season, the wind won’t blow you off the road up the northern peninsula and you can see some viking stuff. We didn’t make it, but make sure you do. Don’t do the night crossing on the ferry. This is an ISLAND in the NORTH. Food and gas are expensive. This is one of the coolest places to visit. If you’re doing the tourist thing and paying for accommodations and transportation, book WAY ahead. Resources and space are limited. The main roads are decent. Anything outside of the Trans-Canada Highway, expect things to be rough. Like really rough. Plan on doing the scenic route on the Avalon Peninsula? Great! You should! Hold on tight though, bud. Castle Hill is not a castle. There’s nothing in Heart’s Desire or Heart’s Delight but Heart’s Content has a neat spot at their lighthouse. The entire island is basically an unspoiled northern wilderness. Make it a priority to do outdoor things or you’re missing the point. Kayak, hike, climb, camp, and explore your heart out, b’y. 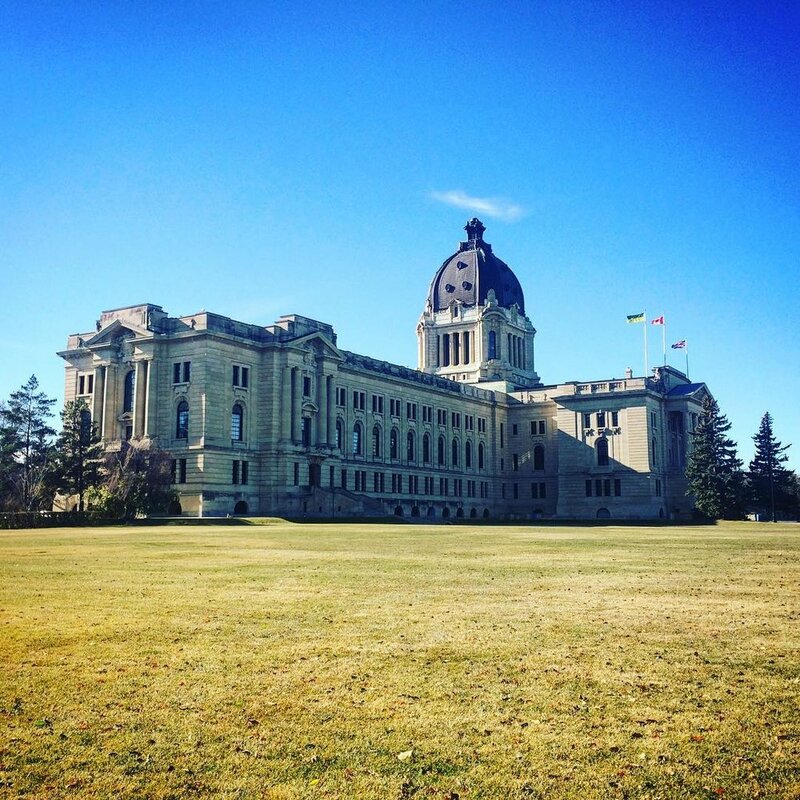 Take some time to learn the history of our youngest province. It’s fascinating. And finally, by the end of your trip, you’ll probably wish you were a native anyway, so pull up to any bar on George Street and be sure to get yourself screeched in. Good, now you’re an honorary Islander. Be on your way and start planning your inevitable return. We hope you’ve enjoyed our tour of Newfoundland. We’ve just barely scratched the surface! If you have your own fond memories or questions, be sure to share them in the comments below. Stay tuned for more stories from the road as we begin to make our way west to the snowy peaks of the Canadian Rockies where we plan to frolic until spring. I’ve been writing and re-writing this personal account of our time spent on Cape Breton Island and have come to a simple conclusion: there are no words to accurately convey the majesty of this landscape. After spending three harrowing days at scorching White Rocks, drowning our moods in Tatamagouche taco heaven, and successfully having our ears talked clean off by a prospector in Cape Jack, we crossed the Canso Causeway. We wove through oddly-placed mountains visiting the Glenora Inn & Distillery and The Rankin Sisters’ Red Shoe Pub, waiting for the landscape to become flatter and moor-like… these are the highlands after all…?? You can look through as many pictures as will dizzy you, read every article and every Lonely Planet tome, but nothing will quite properly ready your expectations of the Cabot Trail. It’s nothing like you think it will be. Imagine our surprise when we crested our first strangely steep hill only to meet sheer towering rock rising straight up out of the sea, daintily supporting at their peaks an impossibly winding highway straight out of a Dr. Seuss tale. One puzzles at how the way was paved. Precariously perched above the ocean along the mountainside, we climbed and dove and wound our way to Chéticamp and the northwest gate into Cape Breton Highlands National Park. Overflowing campsites sent us north to Pleasant Bay just outside of the park boundary where we could spend the night by the ocean - free of charge - and plan our Highlands adventure. We woke up to beautiful clear waters, sweeping sand dunes, a rock beach that sang when the waves would comb through them, and probably the best neighbours we will ever have. We spent three days parked at Pleasant Bay Harbour in absolute bliss. Rolling thunderstorms lulled us to sleep, we bathed in the warmest salt water we had found to date, and the hours were joyfully wiled away getting to know our new German friends in their giant Fuso over-landing rig. We eventually found the strength to pull ourselves back to reality and back into the park for three memorable hikes: The Skyline Trail where we saw pilot whales frolicking from atop the massive headlands, The MacIntosh Trail with its inviting waterfall pools, and finally, steep, rewarding Franey Mountain. A day-trip to Meat Cove ended in back-tracking to a cliff at Black Point with a riff-raff crew of campers-turn-besties with whom we shared campfire, stories, food, and a view of the Milky Way that I will never forget as long as I live. After some housekeeping, swimming, and boon docking in Ingonish, we made our way around sprawling Bras D’or Lake and into the south arm of Cape Breton. We spent a night camped by Louisbourg Lighthouse and enjoyed a slow misty morning by the heaving oceanside with hot coffee, cozy sweaters, and grey rabbits grazing on clover around the van. We spent the rest of the day exploring the absolutely massive French-Built and British-Overtaken Fortress which once sprawled across the peninsula, blanketing the harbour landscape with every class of 18th century architecture - from the humblest of earth-roofed fisherman’s cottages to the most grand of upperclassman’s manors - adorned with fine antique or replicated furnishings, and each restored with precision and care. Our whirlwind Cape Breton adventure came to a close in North Sydney where we tidied Nanook, bought our tickets to Port-Aux-Basques, took our last main-land YMCA shower, and slept lightly in the Walmart parking lot - anxious for our six-hour ocean crossing to mysterious, forbidding Newfoundland. Be sure to follow our friends @fuso_olly on Instagram! We left off in a sketchy Kensington parking lot with a burly fisherman trying to feed me a slimy clam from the back of his pick up truck. Now, if anyone knows me, they are aware that my brain sees seafood and says “that’s not food, Sandra.” It’s a long story, but I’ve made great efforts over the past few years to get over my aversion. I’ve eaten fresh oysters in Ucluelet, ate through a mountain of sushi whilst galavanting in Collingwood, I’ve even been known to swipe a piece or two of shrimp for courage’s sake. None of this prepared me for the moment a large, impatient, smelly fisherman in a Frosty Treat parking lot broke open a bi-valve drowned in its own brine and offered it forward to me to try. My mind raced almost as much as my heart and in three seconds of sheer panic and not wanting to offend - I slurped every salty gooey bit of it back down my confused gullet. We bought two fillets of cod and a quahog clam, threw them in our tiny fridge, and got back on the road - a little sick with adrenaline, albeit, excited for dinner. Summerside offered a pleasant boardwalk and a rest from driving before our last leg of Highway 2 turned into our Highway 14 scenic route. It wasn’t long before the rolling farm hills became rugged red cliffs even more sheer and abrupt than we had seen at Cable Head. We wound and wound along the jagged coast until just after Miminegash, when we decided to turn off down a dirt road - much like we had done in the east - where we found ourselves parked practically on the beach. Perfect. We explored the rocky shoreline littered with periwinkle snails, collected driftwood, and enjoyed a sunset beach fire after Ryan cooked up a memorable seafood supper on the barbecue. Walking back from the fire - the moon impossibly giant, full, and rising right over our tiny home - I reflected on everything that had brought us there and offered the moment my gratitude. Our second day on the west side started with a strong coffee and a trip to the North Cape. A short hike from the visitor centre and we felt like we had truly walked to the edge of the earth. Thousands of swallows darted around our heads and among their nests on the cliff faces. The powerful on shore wind blew relentlessly inland where hungry windmills waited to swallow them up in their monstrous sweeping arms. We stood at the edge watching the waves crash against the monstrous rock reef that stretched just below the water’s surface almost a kilometre out to sea. Some of the most stunning places we have been in the maritimes have held this graceful balance between harsh desolation and an all-but-invisible biodiverse community of extraordinary creatures - ever patient with their strange visitors. Highway 12 snaked south through tiny hamlets that touted river waterfalls, modest bakeries, colourful cottages, and even a soap box derby! Back on Highway 2, halfway between Miscouche and Kensington, we got a text from a friend back in Charlottetown and we motored back to enjoy a visit at the local bike shop. Our last couple of days on the island were honoured with a crazy hot and sweaty ride at Bonshaw Hills, a soul-saving shower at the local pool, and one last dinner and sunset walk at the harbour - complete with a visit from famous local cat, Cutie. Getting ready for bed on our last night, I thought to myself that the only thing that would have made our island visit perfect in every little way would have been sighting just one (apparently plentiful) fox. I sat in the front seat to give Ryan some room to use the kitchen sink, and what came trotting passed but a skinny, bushy-tailed, smarmy, cute-as-a-button F - O - X. Prince Edward Island - we are convinced - you are perfect. I clicked the radio off as the bridge came into view. Ryan and I looked at each other anxious and excited… “This is awesome.” For the longest, quietest twelve minutes, we soared over the Northumberland Strait, and just like that, we were on Prince Edward Island. 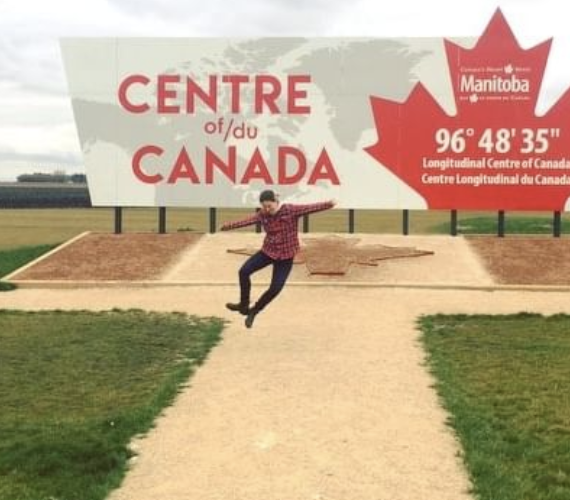 We didn’t know what to expect exactly of Canada’s smallest province, but we figured we would spend about a week exploring what the island had to offer. More than two weeks later, we are reluctantly venturing onward, away from our new favourite home away from home. Our first week was spent camping at trail heads and making new friends as we conquered the peaks and gullies of PEI’s interior. We fell in love with Charlottetown, her amenities and beautiful harbour front, and made the town our home-base for our entire extended stay. Day trips brought us to PEI National Park with its endless beaches, the warm south shore shallows that inspired us to try kite surfing some day, and to the countless well-groomed mountain bike trails that snake through the valleys everywhere in between. 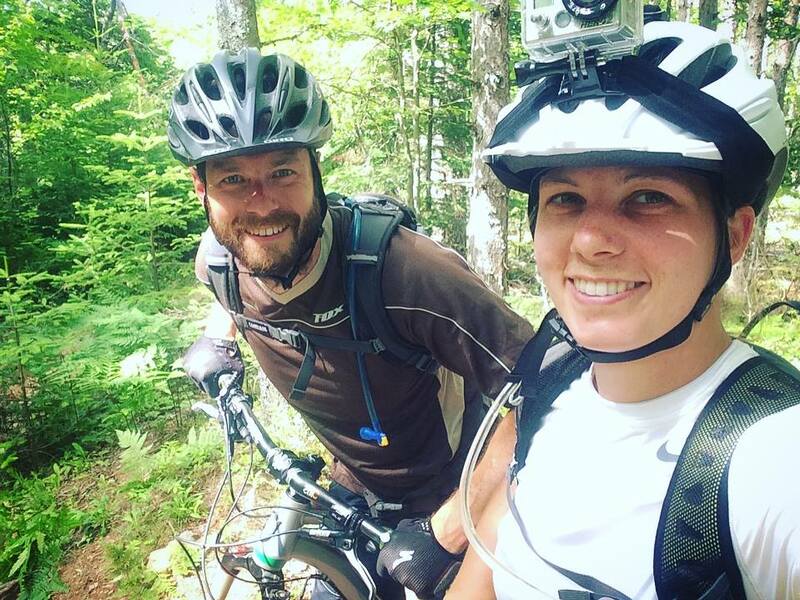 Next, a harrowing 54km adventure on the Confederation Trail - from Mount Stewart to St. Peter’s Bay and back - in the thick summer heat provided unforgettable views of the countryside, two mega-sore butts, and proved that even a rail-trail ride can be a physical accomplishment. We now have an even stronger respect for the many bike-packers we’ve met along the road; God bless you legendary, mile-crushing, pannier slinging travel beasts and your buns of steel! We rounded out our Island tour with two scenic multi-day road trips making a figure-eight from east to west and back again. We loosely followed the coastline, stopping at far-flung Point Prim to see the province’s oldest lighthouse, waded into the sandy waters at Cape Bear, reluctantly passed up Michael Smith’s incredibly tempting (expensive) seafood experience at the famous Inn at Bay Fortune, and washed away the heat (and our seafood sorrows) at Basin Head Provincial Park with an ice-cold shower. We drove into the night to Cable Head East where we wandered down a dirt path out to the water’s edge where we slept the night and revelled in a stunning sunrise over the glowing red cliffside. Day two led us back ‘home’ toward Charlottetown, with a brief stop in Greenwich and a trip down memory lane as we drove the section of The Confederation Trail we had biked just days before. Resupplied and thoroughly charmed by the east of the island, we headed north west up Highway 2 towards Summerside. Just before Kensington, we stopped at a garlic farm where we were treated to fresh violet bulbs, a handful of free scapes, and a recommendation to buy fresh seafood out of the back of a truck just up the road. We obliged. Sure enough, just ten minutes up the road parked outside of an ice cream shop, we found a busy fisherman with his small truck full of the day’s catch. He patiently answered our questions and hurriedly showed us how to shuck a quahog clam, offering it up for us to try on the spot. Find out how it went down in Part 2: Clams, Cliffs, and Critters. A long crazy month ago, we officially left the comfort of suburbia for our new lifestyle in 66 square feet. It seems an opportune benchmark to share what we have learned in that time. Spoiler alert: IT’S A LOT. So buckle up, put your fun hats on, pop some popcorn, and get cozy, because we’re going to share our top TEN things that we’ve been enlightened about concerning all things #vanlife. You must have patience. Patience with your self, with your partner, with the crappy road conditions… the list goes on. Remembering that your schedule is fluid and that everything is going to work out in the end is paramount. You must accept that you are going to be stressed, your partner is going to be stressed, that you are both on a journey, and that all of it is perfectly ok. Any major life change is going to have you bumping up (at times, rather firmly) against your personal boundaries. You can cower and flail and give up, or you can jump in with both feet, get messy, and learn something new that will grow you. We have learned so much about each other and ourselves. 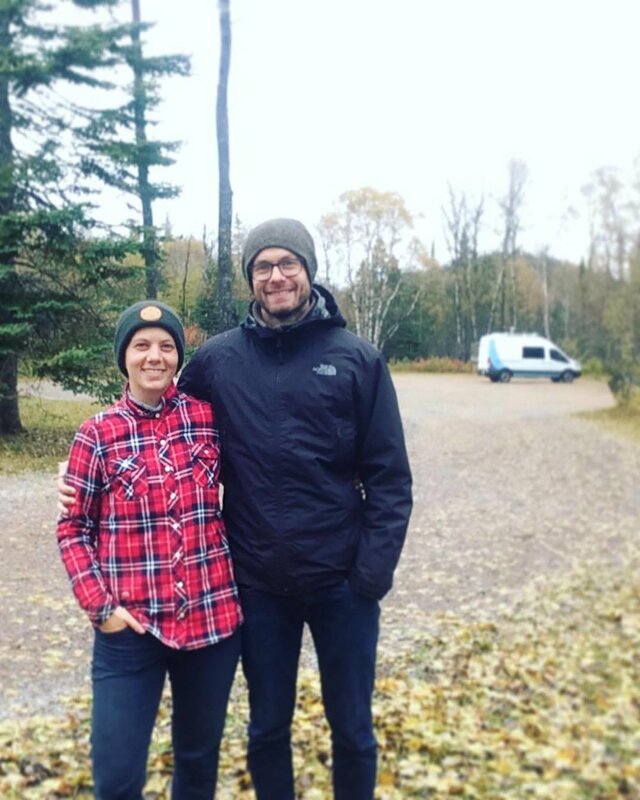 We are more sure of ourselves after one month living in our van than after living together for over four years in a house. You are forced to confront things head on, and your willingness to be open - and to check in with yourself and your partner - is rewarded in turn with clarity, respect, and understanding. Take care of yourself. You’re an adult human. Just because you are doing something that looks fun on Instagram, does not mean that structure gets thrown out the window and life is suddenly going to be handed to you. You have to take care of your self. We say this, not because we struggle with our own self-care (we’re old and generally have this figured out), but because we do feel in-tune with our needs more now than before. You see a lot of people that “quit van life” before they even really get started, and some may have real reasons, but we suspect that lack of self-care might also be playing a big role here. We were already aware of the importance of the following things, but have now developed more of a reverence for: checking in with yourself mentally, making sure we are provisioned, planning meals, not leaving important things to the last minute, keeping your body and your space clean, and being open to making simple necessary changes for the sake of comfort and safety. All of these things, when prioritized, make life - and certainly ‘van life’ - doable. They keep you sane and able to appreciate the awesome adventure you’re on. There’s no vista in the world that can be appreciated from a negative perspective. Get your mind right. Less is definitely more. You don’t need nearly as much as you think you do. It takes all of 24 hours of constantly moving things out of your way to realize you’d rather chuck them out on the side of the road, than try and find room for them. Comfort is important, but when space is at a premium, suddenly a full dish set, giant tote of camping equipment, kitchen appliances, overflowing spice bin, and even your beloved guitar start to make the walls close in and our perspective on what makes us comfortable changes. A month in, we cannot wait to offload half our clothes, toiletries, camping equipment, and kitchenware. One of the first things we chucked and thought we couldn’t live without, was our toilet. Imagine that! No toilet! Yes, we used it a couple times, but because we wanted to, not because we had to. We live in a land of toilets. We got over the loss of $70 pretty quickly when we no longer had to move around our laundry, cleaning supples, bag of outerwear, and vacuum. All of these things and more now live inside our huge toilet box and we feel like we can breathe again. As a rule going into ‘van life’, pack less, spend less, and do less. Don’t bring your apartment, have a budget, and don’t fall into expensive tourist traps. Ruthlessly pair down your belongings, control your spending, and discover how to experience a place for free (or nearly free). We are both introverts. We like to do our own thing and our group of friends back home is small. As such, our outlook on meeting people, and particularly making new friends, was limited. A funny thing happens when you begin to engage more with the things you’re passionate about in life. You meet people that are just as excited about those same things! I know - shocking! In one short month, we have made countless friends and contacts - more than we ever imagined - through biking, camping, and even doing our laundry. We’ve met artists, athletes, wanderers, and entrepreneurs who have engaged us and opened our hearts and minds. We are less afraid now to be open and vulnerable with people. We ask questions and share stories. We accept invitations and enjoy memorable experiences that we couldn’t have planned ourselves. Maybe people out east are extraordinary, or maybe the world is small and people in general are just nice. If you’re lonely on the road, we’re convinced that you’re doing it wrong. 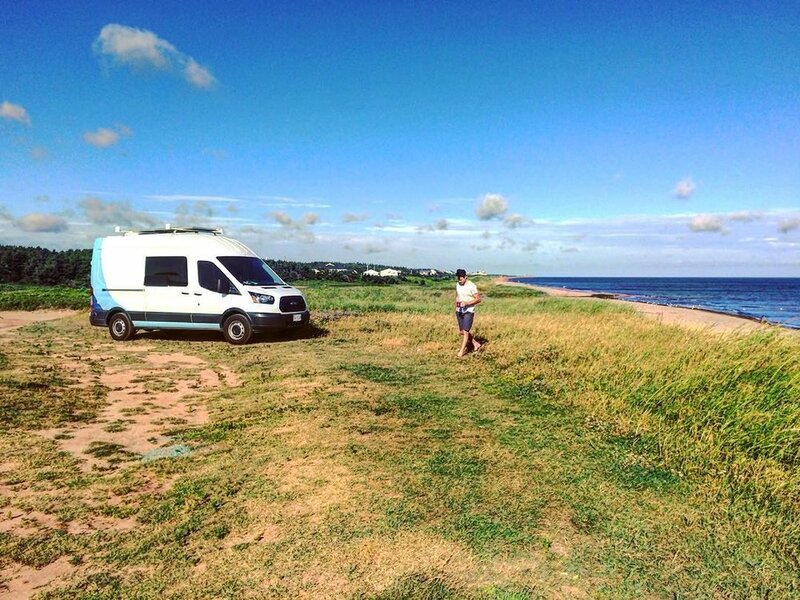 This is a pretty common theme for beginner van-lifers and we were no exception. We are programmed to fit a vacation into a tidy two weeks bookended by 350 days. You want to be efficient and experience everything you can about a place in a short amount of time. You feel like you must, even though you know better. You spend a ridiculous amount of time peeling through guide books and online articles instead of enjoying your scenic drive - fearing that you’ll be underprepared for your next destination or that, heaven forbid, you miss that one amazing coffee shop in that one little town that has a quirky look and a notable barista. Stop. Breathe. Take you’re time. Look around. Be amazed. If you miss something, chances are that there are 50 carbon copies of the same experience. Also, 99% of things worth seeing are free. Also, if you like a place, stay a while! Soak it up. There will be a place on your journey that you thought you’d spend time in that you’ll end up feeling ‘meh’ about and timing will all come out in the wash. Always be willing to slow down, pace yourself, take days to do nothing, take vacations from your ‘vacation’ and check into a campsite or hotel with a nice shower. Take time not just to experience places, but to regroup, recharge, and relax. You don’t always have to be moving. No one presses the ‘reset’ button on life for no reason. Every path you take in life has its big and small ‘whys’ and those whys evolve over time. It’s important not to forget about them and to check in with them periodically. 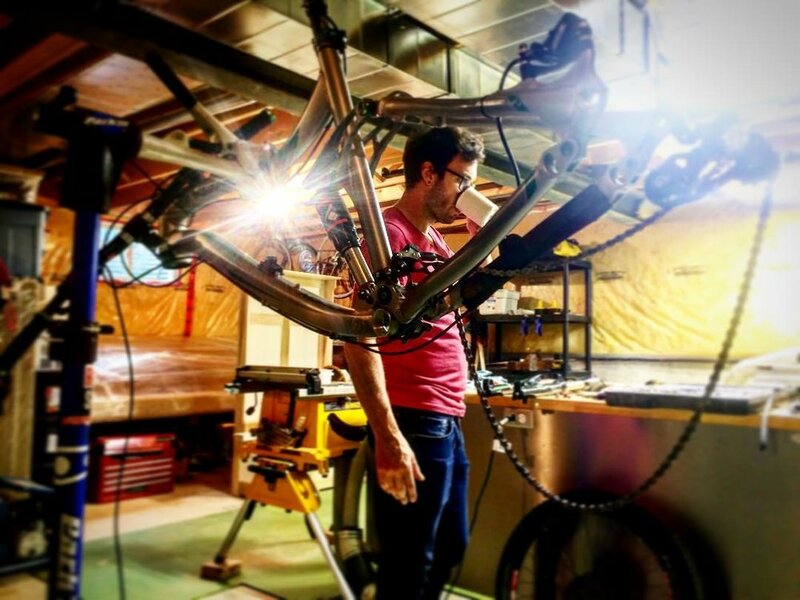 We started this trip with our own personal whys and a rough grasp on our end goal. Both have morphed and even merged in this very short time. It’s important to know that this change is normal and healthy, and that having those whys in the first place is both grounding and purposeful. We talk frequently about our whys: how we feel about them, how they are changing, and how we fit into each other’s narrative. Remembering and checking in with why you started is what will get you through the tough stuff. It gives you momentum and acts as a foundation for personal growth. ‘It looked like fun on Instagram’ is not a strong why, but it’s a jumping-off point for learning why you felt that you needed to do something that ‘looked cool’. See what I mean? Stay flexible, don’t quit, and never stop asking why. Never be afraid to work hard on your self. It’s your one and only life, after all. And if you feel stuck, challenge your whys to an evolution. There will be bad days. This is a lifestyle not a vacation. You will have moments of immense happiness and you will have moments of profound failure. You will overflow your grey water. Your propane alarm will shock you awake at 3:00am. You will run out of food. You will get lost. You will fight with your partner, have a bad night’s sleep, be scared and uncomfortable, and feel let-down. You will also discover untold beauty, share the deepest belly laughs, breathe the most delicious air, and experience the euphoria of catching your first wave on the Atlantic Ocean. Switching up your lifestyle won’t make you happy. You can’t chase happiness and hope to catch it. It’s not a cold. It’s not a place, person, or tangible thing. It’s a state of mind. It’s an incredibly subjective experience. You have to accept that there will be many challenges. 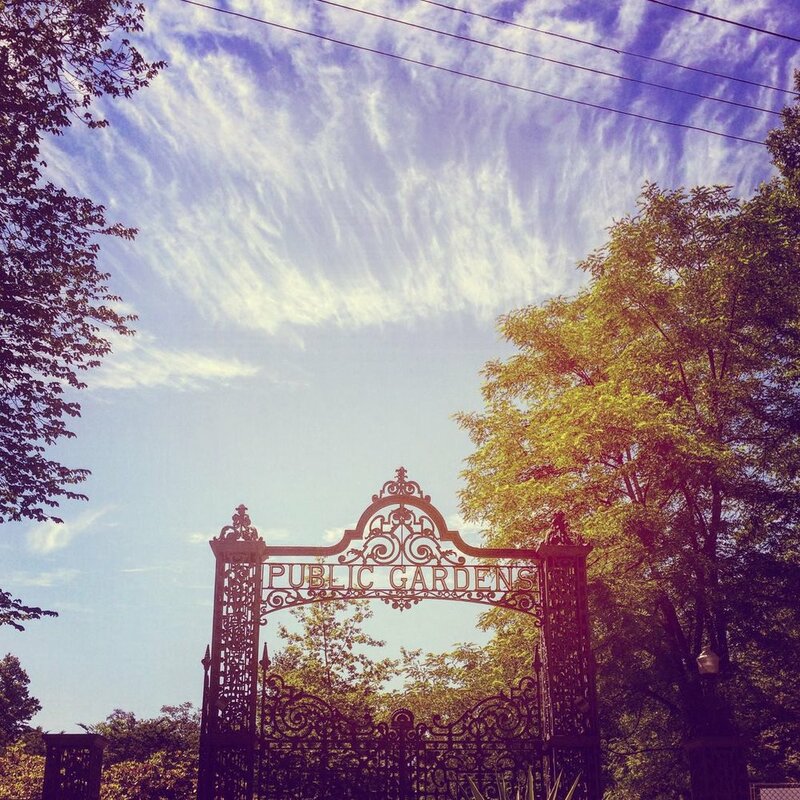 Nothing in life is a walk in the park - even if it’s a really pretty park. Accept that you are a human being that feels, and that those feelings have a sliding scale. Let yourself feel, don’t deny your darkness, and work through the hard stuff. And when it comes to happiness, define it for yourself. Choose it. Decide on it. Look toward the goodness in the world and be ruthlessly positive. Open yourself up to different versions of good. Struggle when you must, and revel when the moment calls for joy. See past your expectations and let the world surprise you. It’s worth it. We’ve developed a deep reverence for ‘the small things’. Going for a sunset walk, having a restful sleep, warm and dry weather, a slow morning with good coffee… all of these things begin to make the grandeur of travelling pale in comparison. We’ve found that the day-to-day comforts are what feed the soul. Perhaps the very best of them is getting clean. Whenever we pass through a larger city, we go through a bit of a cleaning frenzy. We sweep out and wash the floors and surfaces, visit the laundromat, change our bedding, and find a nice place to have a hot shower. I struggle to put into accurate words what it is like to climb into a clean bed in a clean van after a hot shower knowing that the fridge is full and the laundry hamper is empty. Or the incredible joy in a simply nice sunny, breezy day - no rain, heat, humidity, or fog. Heaven. We were awfully smug when we brought home our $20 door screens instead of shelling out for custom no-seeum fitted screens. After accidentally not closing a door all the way one night in the Appalachians, spending hot and humid weather shut inside unable to open the doors, and getting periodically eaten alive by black flies, we can say with absolute confidence: There is no price too high to pay for bug screens if you plan to live in a van. Especially if you plan on travelling inland in the summer. We are headed to Labrador at the end of the summer. We should be concerning ourselves with the road quality and space between gas stations. Instead, all we can think of is “gee, I hope it’s cold enough to keep the doors shut!” The bug factor is real and good screens are key to enjoying the outdoors. It will be the first modification we make before heading out west this fall. You don’t have to live in a van to know that sleep is important. Restful sleep ensures a clear mind, a good attitude, and the mental stamina to endure daily challenges. One aspect of sleep that is specifically crucial to surviving this lifestyle, is having an idea of where you are going to sleep. Restful sleep in a van means discussing, researching, and agreeing upon a safe and comfortable spot to park your butts - well in advance of hitting the pillow. Thanks to the stealthiness of our build, community apps like iOverlander, and the fail-safe Walmart parking lot, we have - so far - enjoyed a lot of success in our parking endeavours, and have kept the dreaded “knock” at bay. Waking up feeling rested, making a coffee, and sitting outside in a comfy sweater - overlooking a harbour or rolling farm hills - is second only to the feeling of clean sheets after a hot shower (see #8). Boon docking is one of the very best parts of living out of our camper, and such, we prioritize it just as we would our food and self-care practices - and so should you! Sweet dreams! Holy Hannah, we made it! 10 big ones. Hopefully this gave you all a little peak into the nitty gritty behind all the pretty pictures. Have a super weekend and give yourself some time for a little adventure. Follow your feet and find your smile. We spent two glorious nights (read: showers) at a paid campground in Sherbrooke, backed right onto the St. Mary’s river. It was a great opportunity to regroup and relax before the next leg of our journey. Excited to see what we had missed in Truro, we headed north and arrived at beautiful Victoria Park with plenty of time left in the day. We climbed the steep access road to the top of the mountain and went our separate ways so I could solo the green trail around the reservoir. If intense cardio under the sun and minimal trail features is your thing, it was a great green trail. Looking for more of a challenge, I pulled up Trail Forks and found my way to some of the blue trail heads. These short trails were a lot more fun, and who did I bump into but my he-wolf! We went back over several of the trails I had ridden with their sudden crazy climbs and fun zippy drops. We rounded out our ridiculously awesome day of riding with a free shower at the pool (this is a massive park), tacos for dinner, and then camped out overnight snug in our bed as visions of Shediac danced in our head….s. Yes, we skipped Nova Scotian Northumberland. Joggins and Cape d’Or sounded amazing, but by now, we had been on several hikes, had seen a lot of The Bay of Fundy, and every port town had a light house. SO we dragged our tired butts out of Truro and made miles all the way to Bouctouche, New Brunswick. It felt weird to not be in Nova Scotia anymore, but that feeling quickly dissipated with a delicious mid-day americano at the local cultural centre. We continued a bit further up the Northumberland coast and were struck by the sight of dozens of locals out digging in the mud at low-tide. Clams! It must be clams! We pulled over and Ryan helped a guy load his truck with his day’s catch. We learned that they were digging for ‘Quahogs’ (yes, like Family Guy). Apparently they are a type of clam that are a bit of an acquired taste. Enlightened, but uninspired to dig for our dinner, we finished our drive at the Bouctouche Dunes. We enjoyed an extraordinary sunset stroll on the boardwalk and adjacent white sandy beach - discovering a treasure trove of shells and watching the varied species of seabirds catch their dinner. The following day, we made our final stop on the Northumberland shore, in Shediac, where Ryan finally got to enjoy his first lobster, as promised, right on the wharf. 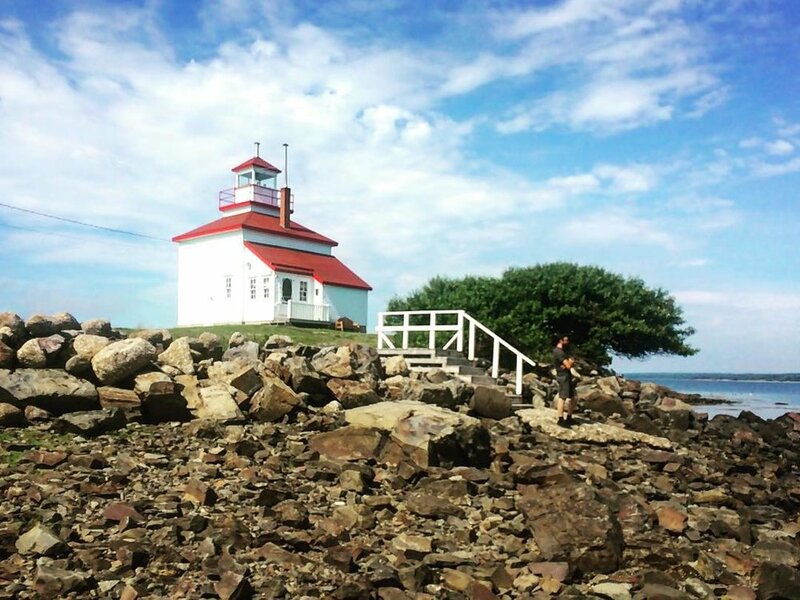 Now that tourist season is in full swing, a lot of the east coast ‘hot spots’ are beginning to fill with people, and Shediac was no exception - truly great for the economy out here, but nevertheless, not our scene. It was time to move on and scratch a new item off our Cross-Canada bucket list… The Confederation Bridge! We’ve spent the passed week following the winding coastal Highway 7. Short excursions into mythical Blue Rocks and sunny Mahone Bay were inspiring and perhaps too short-lived. If we were to visit the south shore again, I’d definitely rent a kayak in Blue Rocks. It was other-worldly. Giant granite boulders leading out to sea, houses sitting precariously over the rugged landscape, and fog that would make you believe in ghost stories. 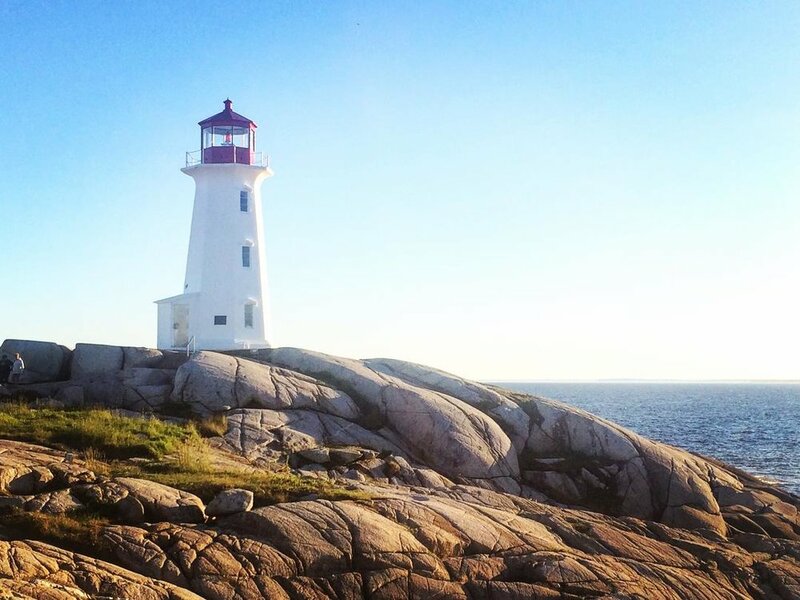 Not far away, Peggy’s Cove swarmed with tourists. We opted to wait-out the crowds in a highway pull-off nearby, nestled in yet another other-worldly landscape: giant boulders placed randomly among salt marshland, alive with birds and sweeping grasses blowing in the sea breeze. We made dinner and waited for the sun to start setting. There were only about fifty people (and a bride!) left wandering the grounds of the lighthouse when we pulled in around 8pm. Perfect. We took our obligatory photos and then sat on the sloping rocks to watch the waves slop and crash in the setting sunlight. Life living out of the van has had its good moments and bad moments. This was a good moment. We stayed for some time and left just in time to finish our night in Halifax. What I was most looking forward to in Halifax was catching up with a childhood friend whom I hadn’t seen in over ten years. That night, we made plans and had the world’s best double date at 2 Doors Down followed by drinks at The Bicycle Thief. We capped the night with a walk on the harbour front and eventually said our goodnights. We headed back to our stealth camping spot by the harbour ready for bed but missing them already. The next two days were filled with a few big-city ‘luxuries’. Ryan spent an entire day mountain biking while I treated myself to a day-pass at the Canada Games Centre where I took full advantage of their sauna, jacuzzi, lap pool, and *angels singing* (((showers)))) for only 12 bucks. Glorious. God bless the maritimes. Thoroughly pampered, I floated out of the aquatic centre to an equally happy Ryan. We had downloaded our favourite YouTube shows at the local laundromat and resolved to enjoy a ‘movie night’ as a small rainstorm moved in. The next day was a self-guided walking tour through downtown ending with drinks on the wharf. Our still-aching bodies are a testament to how much we saw. Halifax is awesome. As with every multi-day stop, we suddenly felt the pull to move on. We woke up Wednesday morning and skipped our normal routine. We crossed the Mackay Bridge into Dartmouth to feast on giant croissants and espresso at infamous Two If By Sea before heading straight to Lawrencetown Beach to survey the swell brought up by a recent hurricane in the far tropical south. We probably stared at the waves for an hour. Ryan finally decided to go for it, and honestly, he killed it. I kept an eye on him from the beach while he rode the cold water and made sure he didn’t get lost in the fog (girlfriend points). I’m mega proud of him. After our midnight propane drama, we got a few hours of sleep before heading back into town for breakfast and coffee. Caffeinated and feeling a little more positive, we attempted to visit the Perkins House Museum (our purpose for stopping in Liverpool) only to find that it had been closed for three years awaiting government approval for renovations. Zing! We instead spent a wonderful morning chatting to the neighbouring museum’s host - a delightful woman who shared our love of travel - who invited us to explore the museum freely and told us all about the Perkins House and its treasures in lieu of its closure. Having made yet another friend, we left Liverpool in good spirits and headed to Lunenburg via Bridgewater to replace our regulator. LU-NEN-BURG! What a place! Driving in, you’re absolutely gob-smacked by the houses only to suddenly realize the harbour full of tall ships and sailboats peaking at you from down the narrow streets that slope dramatically to the wharf. How could you expect any less from the home of the Fisheries Museum of the Atlantic and the famous Bluenose II? We have a habit of saving the best for last, so we started at the top of the hill and walked the winding path through the rows of shops. Halfway down to the wharf, the sky went grey, and we found ourselves huddled under an awning in the rain, peering out longingly at the Bluenose II through the trees. The rain wasn’t going to let up so we ran back to Nanook and resolved to visit the wharf the following day. Our propane situation still on the fritz, dinner was a local favourite - Nellie’s Takeout** - where we watched the squiggly world go by through our front window and called Ryan’s mom to wish her a very special Happy 60th Birthday. Long after we had said goodbye, the familiar sound of her voice floated around the cabin and echoed in our minds making us feel light and heavy all at once. The following day, we woke up at a great spot looking out over the harbour and resolved to continue our quest of exploring Lunenburg. We wove our way down to the wharf only to find that The Bluenose II was missing! We scratched our heads for a few minutes until we saw her sails way off in the distance. It turns out, she sails twice a day with tourists around the harbour and we had just missed her. We filled the time with coffee and book browsing and were rewarded with a free walk-aboard tour of the coolest ship I’ve ever seen. Impossibly tall douglas fir masts, massive dacron sails, and some amazing wood detail made the Bluenose II a must-see. It was hard to imagine that something that big could slice through water at sixteen knots. And so ensues a magical 20 minutes of Sandi standing in a field staring at the stars slightly catatonic while Ryan turns off the propane and opens all the doors to let it dissipate, followed by an hour discussion where Ryan tries to convince Sandi that we don’t need a hotel room, and that we are not going to blow up, and that we don’t need to rip out our entire propane system. If you follow any vanlifer on the interwebs, you may have heard that in this lifestyle there are high highs and low lows. One minute you’re gasping in unison at some glorious vista, the next, you’re standing scantily clad outside in the dark at three o’clock in the morning because your propane alarm went off. Living in tight quarters and spending every day together has pushed us to be flexible, patient, considerate, understanding of our differences and reverent of the things that bond us. It’s been a challenging but welcome opportunity for each of us to find out the things we need to change and to accept the things we cannot. Every time we come along to a larger city, we take the opportunity to do a few chores. Living in 66 square feet is pretty simple, however, things do get dirty and fridges periodically run empty. So, we spent two days in sunny Yarmouth getting Nanook a little back to normal. Dinner at Rudder’s Brew Pub where we got our first taste of Yarmouth’s intense evening fog. K D Laundry on Pleasant Street - ironically the most pleasant laundromat we have ever stepped foot in! Clean as a whistle and provisioned for the next leg of our journey, we headed along the coast stopping to look around in West Pubnico’s historic Acadian village, Shag Harbour’s UFO crash site (NOT my choice lol), Cape Sable Island’s white sand beach, and Birchtown’s historic black loyalist settlement. After a quick spaghetti supper in St. Peter’s churchyard and a chat with a local fella, we left Birchtown to finish our day in Shelburne. Shelburne seemed an unassuming port town as we drove in along Water Street. The houses were older than we had seen… like 1700s old… and then we noticed that all the street signs were adorned with moose heads. As we rounded onto Dock Street, however, it became immediately obvious that this was not just another port town. The narrow waterfront road was lined with some of the oldest buildings we had ever seen. When the British Loyalists left the Northern United States, they moved to Shelburne and built the biggest European settlement in North America! This port was a happening place. We spent the night in the marina lot overlooking the water and it’s many beautiful sailboats that bobbed gently on the current. Morning brought us a wharf-side coffee and a visit to The Dory Shop Museum where a master-builder still custom builds Dory Boats. He and Ryan had a fascinating conversation about all that goes into these simple-looking, but not so simply-built, row boats. After an exciting and caffeinated morning in Shelburne, we took an afternoon drive to Keji Seaside National Park where a short hike through thick brush brought us to some of the best, unspoiled oceanfront either of us had ever seen. White sandy beaches, big rocky headlands, grey and harbour seals basking on rocky outcrops, and the clearest turquoise water as far as you could see. It was a remarkable seaside wilderness that was well worth its 6+ Km bumpy entrance road. We left off in the harbour town of Digby, Nova Scotia, where we celebrated a memorable Canada Day. Our original goal was to then head up the Digby neck to visit Long Island, but we were feeling more excited about ending our day in Yarmouth. So, we changed course, first, with a jog inland to the tiny hamlet of Bear River. This tiny artsy first-nation community is steeped in Mi’kma’ki history and has a lot to offer with its world-class ‘Flight of Fancy’ art gallery, Sissiboo coffee roastery, friendly habitants, and a gently-rolling inky black river that cuts right through the middle and begs the avid paddler to put-in. We then headed back toward the coast and picked up the Evangeline Trail which led us through the endless charming Acadian burrows that dot the French Shore from Digby to Yarmouth. We stopped several times to take in landmarks like the Gilbert’s Cove Lighthouse - which once housed a family of seven, Weasley style - as well as the behemoth St. Bernard and Église Sainte-Marie Catholic Churches which tower over their tiny towns. Our last stop before Yarmouth was Maitland Beach Provincial Park. Lined with fragrant rose bushes and boasting a sprawling white sand oceanfront, it was the first time either of us had truly stood and looked out into nothing but Atlantic Ocean. It felt incredible to experience that together, even more so, as we had only just done the exact same thing on the Pacific Ocean just one year ago. We woke up Saturday Morning at serene Lumsden Pond to warm sun and an empty lot. We enjoyed our morning coffee by the water and decided it would be a good day to get a few chores done. We headed back into Wolfville - our new favourite town - and grabbed breakfast at the farmer’s market where we ran into our new friend, Hyla! A quick peruse around the market and an old bookstore had us toting treasures which we dropped off at the van before heading to the hardware store and then to TAN Coffee - wifi central. There we had a wonderful chat with our new friends from the market (I swear, I’ve never had so many friends. People are so nice here!) and I finally uploaded my first blog post (yay!!). Ryan was really itching to have his first ride in Nova Scotia so with our errands complete, we were back on the road. Kentville Gorge offered Ryan a challenging and interesting ride while I spent some time working on the van. I restrung our fairy lights that had been flopping around, reorganized the cupboards, and most exciting of all, found home for the mountain of STUFF that was living on our bed. Before today, we had been moving two hiking packs, a guitar, a ukulele, our window shade, some clothing, a bag of hats and mitts, and our laundry bag EVERY DAY. Once in the evening off of the bed and then again in the evening off of the bed. UGH. To make room, we sacrificed our toilet to the recycling gods and repurposed the giant bench seat to house all of our random items. It’s so much better now. We have certainly learned the hard way that less is more. Room to breathe is more important than something you think you might miss. We can’t wait to pair down even further. It’s amazing what you don’t need. Ryan returned from his ride happy and sweaty so we headed back to where we started our day at Lumsden Pond for a refreshing swim. Clean and fed, we decided to head down the highway through the Annapolis Valley to a little harbour we had found on iOverlander. We squeezed into the tiny parking lot just before 10pm and took a few minutes to explore the tiny harbour of Hampton - an interesting juxtaposition to the giant mountain we had to drive over to get there. A small lighthouse, some interestingly shaped sheds, and four small fishing vessels sitting on the sea floor aside the wharf made for a cozy feel. A family enjoyed a campfire down the beach and a VW Bus with European plates was our neighbour for the night. Our morning was a brief lookout over the stinky bay to spot seals before deciding to head straight to Annapolis Royal for our morning coffee/bathroom/breakfast time. The stretch of highway was dotted with wild rose bushes that filled our tiny home and replaced the moldy sea smell of the harbour with a pleasant intoxicating aroma. It always feels so good to get back on the road, off to a new place! Annapolis Royal and Port Royal were dripping with history. It seemed incredibly fitting to visit Canada's first European settlement on Canada Day. We had a great coffee and met new friends Warren and Jenny - two cyclists that were on the same trip as us only on two wheels - incredible! After visits to historic Fort Anne, the Sinclair Inn (second oldest wood building in Canada! ), Tripp's Gallery, and the reconstructed Port Royal, we got back on the road, this time, to Digby. We weren't sure what to expect in Digby. Locals and guidebooks alike suggested a quick pass-through as apposed to it's charming counterparts. Nevertheless, we thought was would try our luck at finding some dinner. Boy, were our expectations exceeded! We strolled into Shoreline Restaurant and snagged their very last patio seat overlooking the harbour and there was even a live band playing on the lawn. Ryan enjoyed a meal of scallops and I dove into the best burger of my life. We strolled the wharf after dinner to take in the sunset, then made our way back to the boardwalk for an excellent fireworks display. I’ve been trying to write my first blog post for the passed week and a half and I’ve come to the conclusion that perhaps a daily blog is necessary. I couldn’t have guessed that we would do and see so much every day. Our country is giant and beautiful and awesome and there is so much to explore. 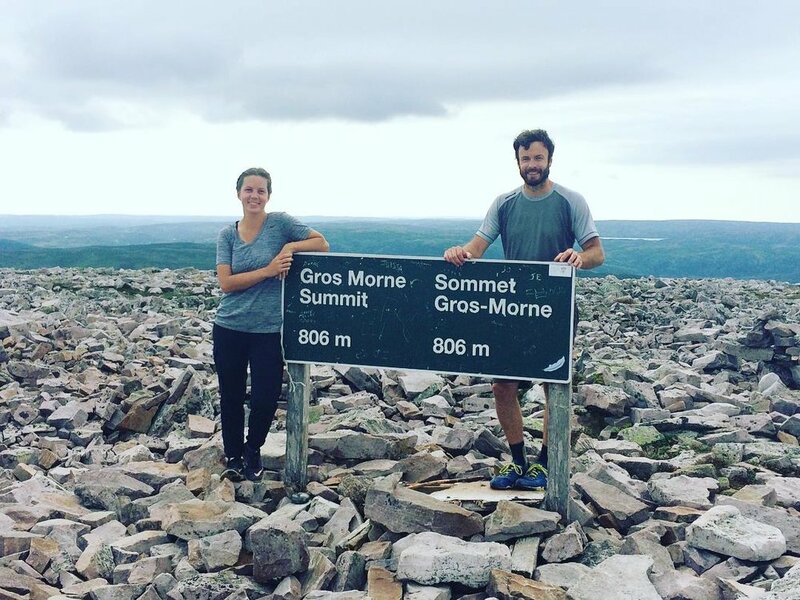 In this short amount of time we have circled the Golden Horseshoe, survived the zoo that is driving in Quebec, climbed one of the tallest peaks in the Maritimes, walked the ocean floor, sampled organic farm life, and survived illness and discomfort that some couples may never know. And that sentence only scratches the surface! I’ve lost count of how many wonderful people we have met (some at the laundromat!) and how many times we’ve crested a ridge in the road only to gasp in unison at the vista gifted to us. We have bathed in a river and slept by the ocean. We’ve sung along to George Strait driving through the Annapolis Valley and spent rainy nights playing crib and drinking craft cider. The East Coast has been everything we imagined and more. We hope that you’ve been following our Facebook and Instagram posts over the last few weeks as they give an excellent glimpse into the sheer untouched beauty that the East Coast of Canada has to offer. My heart aches a little for the stories I’ve been dreaming up each day that will decidedly not make it to the blog, but I’m excited to start sharing our days as they happen. And so with that, I’m packing up the last two and a half weeks into a tiny memory box in the back of my mind to treasure always. Boots are on, camera is primed, hands are ready to write… let’s go exploring!